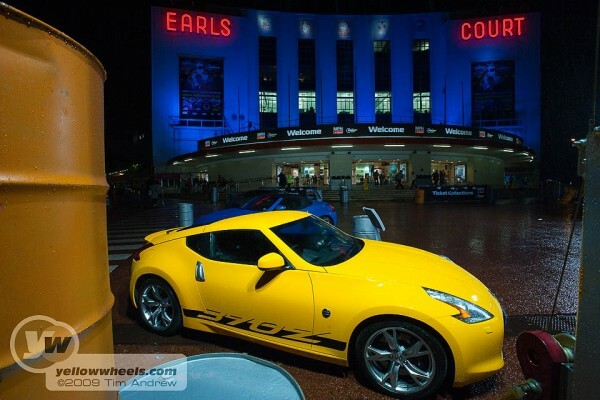 MPH Show / Top Gear Live: is it a motor show, gladiator’s arena, or a circus? No: it’s ice skating for cars; Clarkson and co on ice, with all the paraphernalia. OK, so it’s meant to be a family show, but does it also have to be panto? Featuring Mother Goose, Snow White and the Wicked Witch, cars skated around, fire canons roared, and a frigid mist descended onto the haunted floor of Earls Court. More chilling still, was the cool wall where the heckling crowd decided which motors would live or drown. Produced out of a magic cauldron (or garden shed), presenters Jeremy Clarkson, James May, and Richard Hammond raced farcical chariots built from gardening gear, quite clearly not made by them, but the props dept…This was more Roman arena, than London cat walk, with very desirable cars being consigned to the uncool wall, if not mauled by lions. Last chance to see whether good or evil prevail in the UK is tomorrow 15th November at Birmingham NEC, before we can gladly shout “it’s behind you !” and the show moves onto sunnier climes (well, Dublin actually). Never mind, ’cause the crowd were loving it, and there was a wealth of motoring splendour to drool over in the main hall. Rather than trying to catalogue the whole show, we decided to restrict our cameras to the yellow beasties laid out, grid like, for the public’s delectation. Enjoy the photo gallery. We’ll be bringing you more posts from the show soon. If what we’ve said sounds a little uncharitable, let us explain, that we are great fans of the Top Gear TV programme, but found the show inevitably staged, stilted, over-rehearsed (?!) and lacking the pace of the TV show. 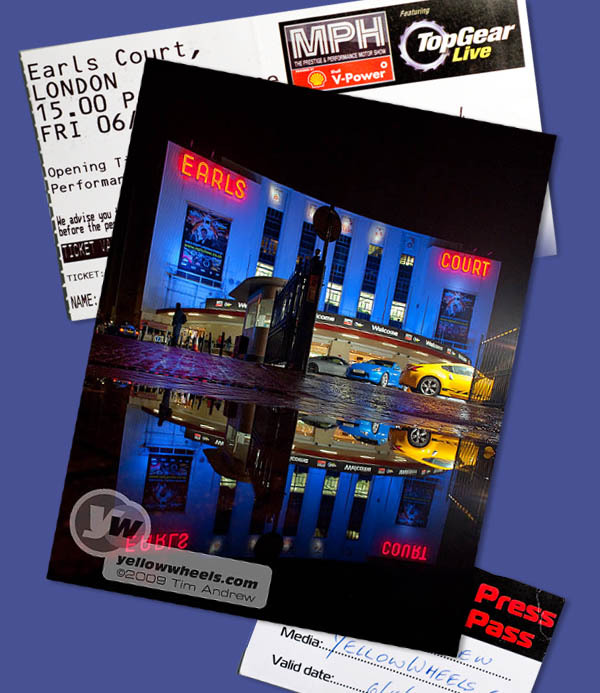 In sum, there’s an immediacy and excitement that can’t be repeated with a live show. Skillful editing of TV footage makes for a dynamic flow of content that’s not practicable on stage. A major part of the TV show’s appeal are the wonderful locations and amazing filming. You can forgive the motley team’s flippant remarks when TV is this good! 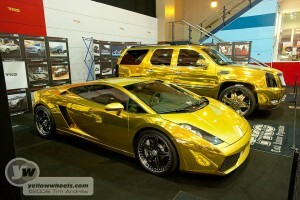 How gold do you like your car ?! Our jaws dropped when we saw this golden Gallardo. Totally over the top of course, but suiting the Hollywood environment of the show’s stars and cars. 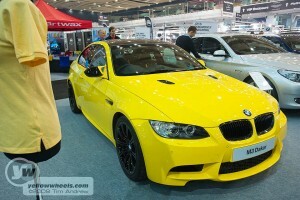 Custom conversions, and outrageous paint are MPH Show’s forte, but lurking menacingly on BMW Park Lane’s stand was a dashing Dakar BMW M3 – yours on the road for a smidgen under 60K (UKPounds). This is available as a factory special spec limited edition, so reassuringly, hasn’t been disassembled, tinkered with, then reassembled after manufacture. Two cars we squeezed into the photo gallery despite being more orange then yellow, are the Caparo and Ariel Atom 3. The Caparo has to be the car visitors would most want to take for a trackday blast, followed shortly by the Ariel.